Some of the best music therapists in the nation returned to their alma mater on April 1 to celebrate 40 years of the University of Iowa’s music-therapy program. Using music as therapy can improve social skills for children with autism, she said, in addition to dealing with numerous mental-health issues and even decreasing the perception of pain. Judy Simpson, director of Government Relations for the American Music Therapy Association, said music therapy can also help premature infants, veterans with post-traumatic stress disorder, and people with Alzheimer’s and mental-health issues. 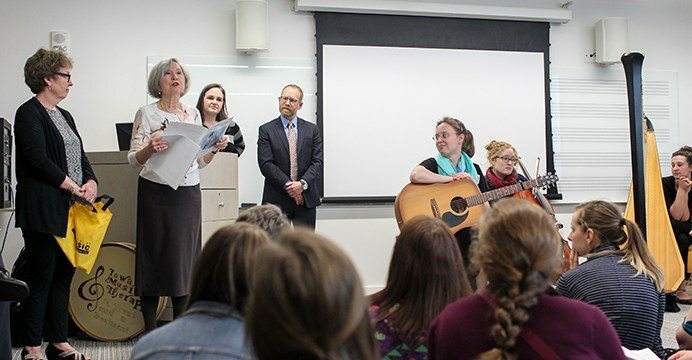 To celebrate the UI Music Therapy Program’s 40th anniversary, alumni gathered for a day of speakers and presentations, slide shows for each alum, and a reception that included a ribbon-cutting ceremony for the new music-therapy room in the Voxman Building. Alumna Bethany Riedel, a board-certified music therapist working in Tomah, Wisconsin, for the Veterans Affairs, returned for the event to reconnect with old classmates and rejuvenate. Barbara Reuer, the CEO and founder of MusicWorx, a music therapy and wellness agency who received her doctorate at Iowa, was excited to be back. Reuer’s agency in San Diego takes on four interns every year, and she said the interns are often from the Iowa program. Adamek said the program is very selective, and the faculty know each student. Usually, there are approximately 45 students at one time. There’s a level of excellence, she said. Simpson, although not an alumna, agreed. Simpson said more health centers and education facilities realize the importance of music therapy as a treatment option, so music therapy receives more attention and more students are entering the field. There are currently 7,000 board-certified music therapists in the nation, she said. However, Reuer said, this is not enough, considering the benefits of music therapy. UI student Brenna Oates, who is in the music-therapy program and helped run the event, said she was inspired by the outstanding music therapists, both professionally and personally. Riedel said the program means family.